For anyone keeping track, my usual every two to three weeks posts have not appeared for the past six weeks. Unexpected events pushed aside time I might have used to post. Some were unplanned but pleasant surprises such as an opportunity to write a song and create a video, a blast of inspiration for a new play, a push to apply for a writing fellowship, bookings for eight workshops in eight weeks, trips to see family and do college touring with my middle child. Others were not as welcomed occurrences. Friends and friends’ children struggling with depression and needing support, making time to visit a special family friend who may not be with us on this earth much longer, our oldest wrestling with issues requiring parental wisdom, extra responsibilities because of difficulties in the lives of others, our middle child being in a car accident. Last night, a friend asked if I wanted to cancel and reschedule a get-together we had planned a couple of months ago for this coming week with a group of moms I know. “No, no I’m not,” I said. And it’s true. I don’t believe in survival mode. The more difficult life is, the more likely I am to get together with a friend for lunch, take my son on a trip to a museum, go out to dinner as a family, dance with my daughter in the living room, or help a friend with a book edit even though someone might argue my time would be better spent elsewhere. Life is short, and life can turn on a dime. I’ve been to enough funerals to attest to both facts, and I have now had two of my three children in car accidents which could have taken them from me without any warning. Life is not meant to be survived. It is meant to be lived. Every minute, every day, because you don’t know what you’ll have for time. And that may be why I invest so much of my time helping people with their food issues. Physical necessity dictates not only that we have to eat but that we need to do so at regular intervals throughout the day. This means part of our “living” time is thinking about what to eat, making what we’ll eat, and eating. So, food, too, should not just be about surviving but about enjoyment and benefit, just like everything else we do in and with our lives. This year my oldest decided she would become vegan, and recently my husband’s sister’s family decided to do the same. For my daughter, eating vegan means doing her part to make the world a better place to live. For my brother-in-law and nephews and niece, it’s about embracing a better, healthier lifestyle. For both, they are making choices to live lives which are not just about surviving but about being happy with the decisions they make about what to eat. Given my dairy allergies and my son’s egg allergies as a child, a lot of what I make was already vegan, but I’ve begun experimenting with more recipes of late to expand my repertoire. Last month I made a vegan chickpea curry which the family really liked and which is so easy because it just cooks in the crock pot. I will share it below. 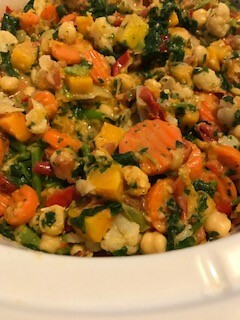 In a 6 quart crock pot mix together the chickpeas, cauliflower, carrots, squash, peppers and kale. In a shallow pan, heat the olive oil for a minute, then add the garlic, curry powder, and paprika. Heat for a minute, stirring continually. Add the tomatoes and bring to a simmer, about 3-5 minutes. Add the “milk” and bring to a slow boil. Stir in 1/4 cup flour and whisk well, stirring continually until the mixture is smooth and begins to thicken. Pour the sauce over the ingredients in the crock pot and blend well. Cook on low for 6 to 8 hours or high for 3 to 4. Serve by itself or with rice or with bread.